In 1997, at the request of Intel, CPES established a voltage regulator module (VRM) mini-consortium to address the issue of power management for future generations of microprocessors, targeting at sub-1 volt and 100-200 amps current. As a result of this focused research, the CPES team has developed a multi-phased VRM. Instead of paralleling power semiconductor devices in order to meet the current demand and efficiency requirements, the research team proposed to parallel a number of mini-converters. By paralleling the mini-converters and phase-shifting the clock signal, the team was able to both cancel the significant part of the output current ripple and increase the ripple frequency by N times, where N is the number of channels paralleled. This resulted in significant demonstrated improvement, specifically: 4 times improvement in transient response, 10 times reduction in output filter inductors, 6 times reduction in output capacitors, 6 times improvement in power density, and 3 times improvement in profile. The new generation of Intel's microprocessor is operating at a much lower voltage and higher current, with a fast dynamic response in order to implement the sleep/power mode of operation. This mode of operation is necessary to conserve energy and to extend the operation time for any battery-operated equipment. The challenge for the VRM in this case is to provide a precisely regulated output with fast dynamic response in order to transfer energy as fast as possible to the microprocessor. Today, every Intel processor is powered by such multiphased VRMs developed by CPES. 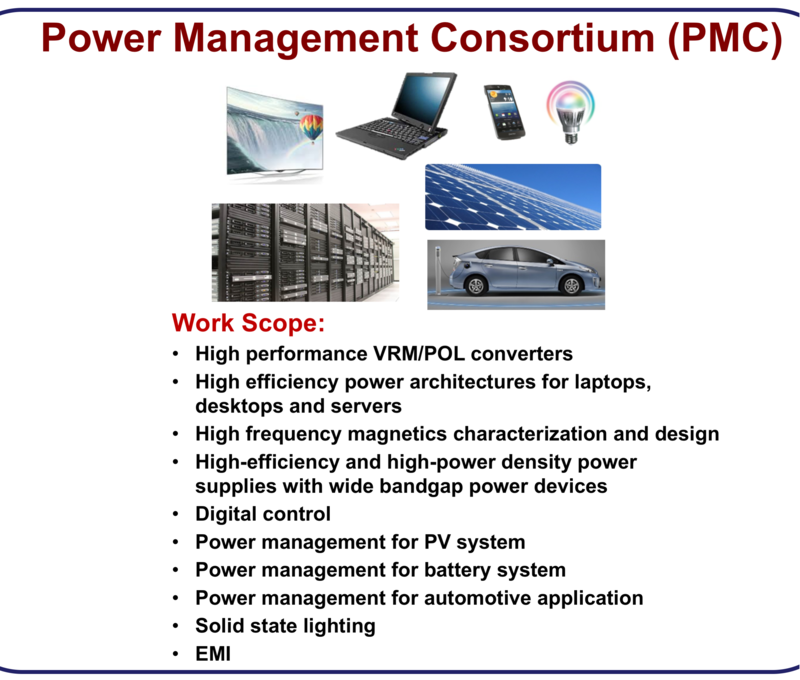 The Power Management Consortium (PMC) is an outgrowth of the early VRM mini-consortium initiated in 1997. The goal is to extend its research scope with a focus on developing pre-competitive technologies in areas of power management for distributed power system architectures, EMI/EMC, power quality, ac-dc converters, dc-dc converters, POL converters in applications including microprocessors, tablets, notebooks, desktops, servers, data centers, networking products, telecom equipment, solid-state lighting, battery chargers, transportation, renewable energy, and other industrial and consumer electronic applications. The PMC mini-consortium has accumulated a wealth of knowledge and made significant contributions to the power management industry. The PMC emphasizes developing high-efficiency, high-power-density switch-mode power supplies based on recent developments in wide bandgap (WBG) power devices. This emphasis is highly leveraged with the recent Department of Energy "PowerAmerica" award. CPES is a partner in this multi-industry, multi-university collaborative program for a period of five years. The role of CPES is to work with the WBG manufacturing industry to explore potential applications and impacts of gallium nitride and silicon carbide devices on power conversion technologies.